arbara McClintock (1902-1992) was a remarkable scien-I tist who made several very important discoveries in genetics dealing with chromosome structure. Her studies were carried out before the age of large interdisciplinary research teams and before the sophisticated tools of molecular genetics were available. Her tools consisted of a clear mind that could make sense of confusing and revolutionary observations, and a consuming curiosity. She worked 12-hour days, 6 days a week in a small laboratory at Cold Spring Harbor on Long Island, New York. In 1983, at age 81, McClintock received the Nobel Prize in Medicine or Physiology largely for her discovery 40 years earlier of transposable elements, or transposons, popularly called "jumping genes." Her experimental system consisted of ears of corn. She observed various colored kernels that were produced by different enzymes (see figure 8.3). If the gene coding for an enzyme responsible for color formation was inactivated, the kernel was not pig-mented. If the enzyme was only partially inactivated, then the kernel was partially pigmented. Thus, by looking at kernel colors, McClintock could detect changes in genes. She concluded that pieces of DNA must be moving from one site on the chromosome to another, because the kernels had different colors. When a piece of DNA, the transposable element, moved into a gene, the gene was unable to function. When the transposable element left a gene, and the gene was restored, it would function properly again. At the time McClintock published her results, most scientists believed that chromosomes were very stable and unchanging. Consequently, most geneticists were very skeptical of McClintock's heretical ideas. As a result, she stopped publishing many of her observations. It was not until the late 1970s that her ideas were accepted. By that time, transposable elements had been discovered in many organisms, including bacteria. Although first discovered in plants, once transposons were found in bacteria, the field moved ahead very quickly. The techniques of molecular biology, biochemistry, and genetics made the understanding of "jumping genes" possible. 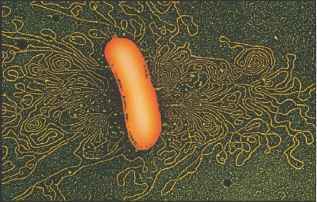 DNA bursts from this treated bacterial cell. again, and many of the Shigella strains causing dysentery were resistant to sulfa. 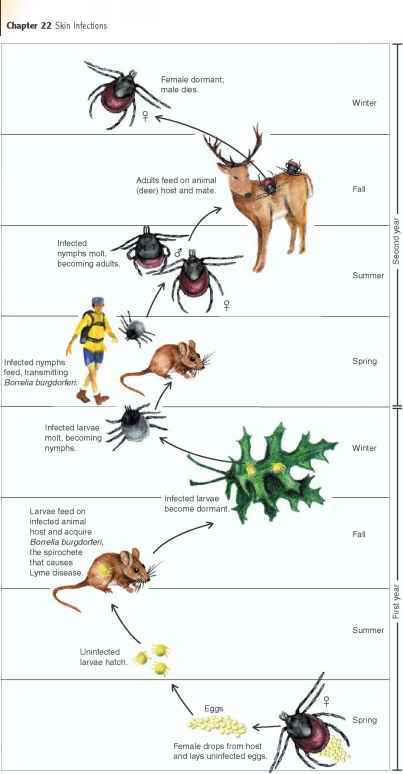 Fortunately, these organisms remained susceptible to such antibiotics as streptomycin, chloramphenicol, and tetracycline. A new problem arose, however. In 1955, a Japanese woman returning from Hong Kong developed Shigella dysentery that did not respond to any antimicrobial treatment. In the next several years, a number of dysentery epidemics developed in Japan. In some patients, the causative organisms were sensitive to antimicrobial medications; in others, they were resistant. Curiously, bacteria isolated from certain patients treated with a single antimicrobial medication abruptly became resistant not only to that medication but also to other antimicrobials as well. In addition, cells of Escherichia coli residing in the large intestine of many of the patients who carried antimicrobial-resistant organisms were also resistant to the same antimicrobial medications. 192 Chapter 8 Bacterial Genetics other sensitive cells in the population, thereby creating a largely resistant population of cells. Bacterial genetics encompasses the study of heredity— how genes function, how they can change, and how they are transferred to other cells in the population. After reading this chapter, you should understand how antimicrobial resistance has become such a serious problem in the treatment of infectious disease today.